After my “cutting” experience with the double-edge safety razor last week, I decided to look into “pre-shave” creams and oils. 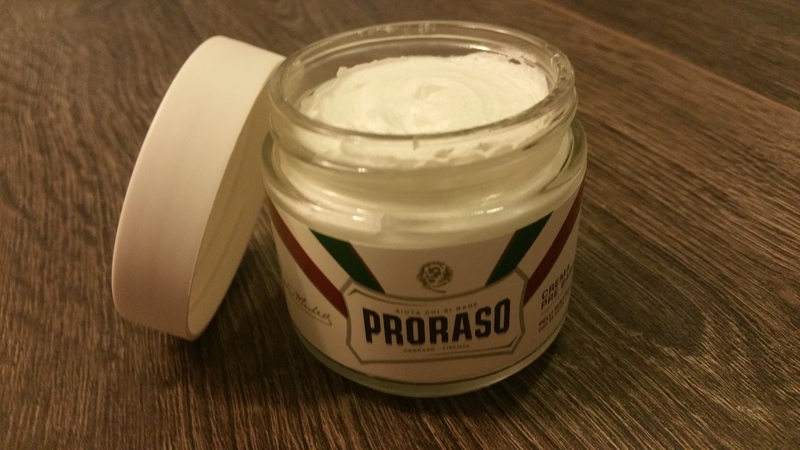 Having fairly easy access to Proraso products, I picked up their “Crema Pre Barba – Pelli Sensibili”. Or in English, Pre-Shave Cream, Sensitive Skin. I opted again for the sensitive skin version to have the least amount of perfume and to put all of the odds on my side in order to eliminate or avoid any irritants. As you can see in the picture the cream looks nice and buttery. Part of me is thinking that applying a “pre-shave” cream is over-kill. I mean, the shaving foam is supposed to do the job of insulating the moisture of your face, offering a barrier between your skin and the blade(s) and finally lubing the said blade. It should be able to do it all, right? Since, I have only ever used a shaving cream/foam/gel to shave, I don’t know any better. But when asked, I know very few products capable of doing more than one thing very well. In that light, there might be value in exploring if a pre-shave cream can render a better shave experience. As per the packaging: “softens the beard, protects sensitive skin against razor burn and prevents skin rashes”. OK this is again a tall order, but I want to think that it might do one of these things very well, like maybe soften the beard even more than the hot shower. Then if the shaving foam does one of its thing very well like lube the blade, my face might be winning a smooth shave experience. Since I recently had a bad experience with a safety razor, I am a tad more motivated in finding that “smooth” shave. Tomorrow morning will be testing time. Coming out of the shower, it was shave time! I dipped my fingers in the pre-shave cream. It feels somewhere between butter and Miracle whip. It went on very easily and it took very little of the cream to cover my face. Considering that I was also going to use some shaving foam, I was careful to not over do it. Then something kicked in! The cream started doing its magic. Think of a tingly citrus sensation. It’s not minty. Definitely more citrus, but minty would be a neighboring feeling. It’s not exaggerated and its not unpleasant, but it is a bit of a surprise. It felt like my beard was being raised or woken up. I then applied the Proraso Sensitive shave foam and used my trusted Gillette Fusion Proglide. The razor slide ever so smoothly and it felt like velvet. Readers, this was one of my most pleasant shaves in quite some time. I actually took a moment to be impressed. I washed off what was left of both creams with a hot wash towel and finished with the Proraso after shave lotion. We could say that this was the full Proraso experience. My face felt smooth and perfectly shaved…all day long. Concerning the tingly citrus or minty sensation, I should say that I have experienced something similar with two different products in the . The Suavecito Shaving Cream and the Pacific Shaving Company Caffeinated shaving cream. These are both not pre-shave creams. 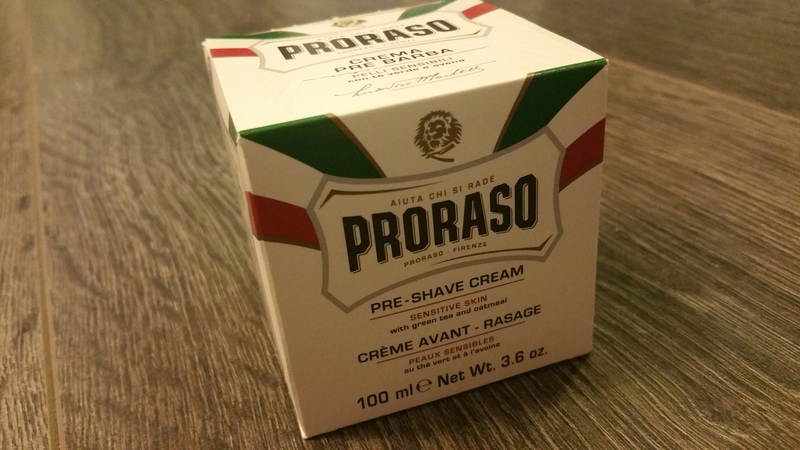 They are shaving creams, but I suspect that are containing some similar “pre-shave” ingredients as those founds in the Proraso cream. Basically, they are trying to be both the pre-shave cream and the shaving foam. Having experienced the pre-shave cream as a separate product, I am preferring that approach as you can tailor the two products to your shaving needs and style. Not wanting to sound like a commercial or a Preacher, but I find it timely and fitting that a maker of shaving products like Proraso has understood that things are not necessarily meant to suit everybody as it comes out of the manufacture. By that I mean, there doesn’t have to be one shaving cream for everyone. By offering a good quality solution for each tasks and giving you the freedom to make your perfect concoction is in my mind the best strategy. Being able to customize your products combinations and your quantities of these products is a fabulous way of letting the user reach that ideal “shaving” experience. Back to business, I would recommend using this pre-shave cream if you are subject to irritation during shaving or if you find that your shaving cream is not offering the best possible glide or lastly if you just want to take your shaving to the next level of comfort. For me, it was a fantastic addition to the whole experience. It motivated me to further explore the “pre-shave” options. On that note, I picked up a new pre-shave oil from a Canadian company from Montreal; Groom. Stay tuned for that review. Use the below links to shop for this product.